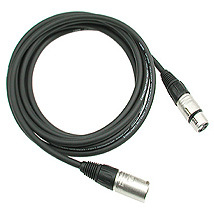 Klotz 32ft microphone cable. Ultra Low Capacitance! Extreme flexibility is the hallmark of the M-1 microphone cable. Yet these cables also feature extra-thick, stable outer jackets giving protection against all types of mechanical strain, making them the Number One cable of choice for professional touring. Cotton yarn wrap maintains consistent capacity during the wildest stage shows, and an extra-dense spiral shield provide outstandingly efficient screening and crystal clear sound. The smooth, matte-finish exterior is pleasant to handle and especially designed for singers who perform for hours with hand-held microphones. The cable features metal connectors by NEUTRIK.